JERUSALEM – Desiring to convey National Religious Broadcasters’ unwavering support of Israel, Dr. Jerry A. Johnson, NRB’s president & CEO, presented to Israeli President Reuven Rivlin copies of resolutions adopted by the NRB Board of Directors over the last three years during an address to Christian media professionals at the President’s Residence in Jerusalem on October 16. The presentation took place on the third day of the four-day Christian Media Summit, a conference sponsored by the government of Israel for approximately 180 Christian media representatives from more than 30 nations around the world. In addition to Johnson, NRB representatives to the summit included Board Chairman Michael Little and James A. Smith Sr., vice president of communications. It was the second such gathering, following the event of the same name held in October 2017. Johnson praised Rivlin’s willingness to speak up for religious minorities in Israel, including Christians. “We’re very grateful for your openness and spirit,” he said. Noting the ancient connection of the Jewish people to Jerusalem, Rivlin mentioned an archeological discovery – just two weeks prior to the event – of a stone inscription of “Jerusalem” written in Hebrew, dated more than 2,100 years old. “It’s the oldest item we have ever found with ‘Jerusalem’ written as we read it today,” he said. Rivlin commended the Christian journalists for coming to Israel. On October 14, Israeli Prime Minister Benjamin Netanyahu addressed the Christian Media Summit, as well as U.S. Ambassador to Israel David Friedman. Israel is a “robust democracy,” Netanyahu said, and the “only country in the Middle East where the Christian community thrives and grows,” noting his government’s commitment to protecting not just Christians, but Christian religious sites. After his address, Netanyahu took questions from both the Christian and other journalists covering the event. In response to a question about whether his government had considered appointing an ambassador to the Christian world, he said, “I think that’s a great idea. I think I’m going to do it,” writing a note to himself and putting it in his pocket. The subject of truth was also a theme of Friedman’s remarks to the Christian journalists. Although he does not observe “in a religious sense” the teachings of the New Testament, Friedman said he was “fond of many of its insights,” and particularly Jesus’ statement, “Then you shall know the truth and the truth shall set you free,” quoting John 8:32. The theme of this year’s Christian Media Summit, “70 Years of Israel,” marked Israel’s 70th anniversary as a modern state. 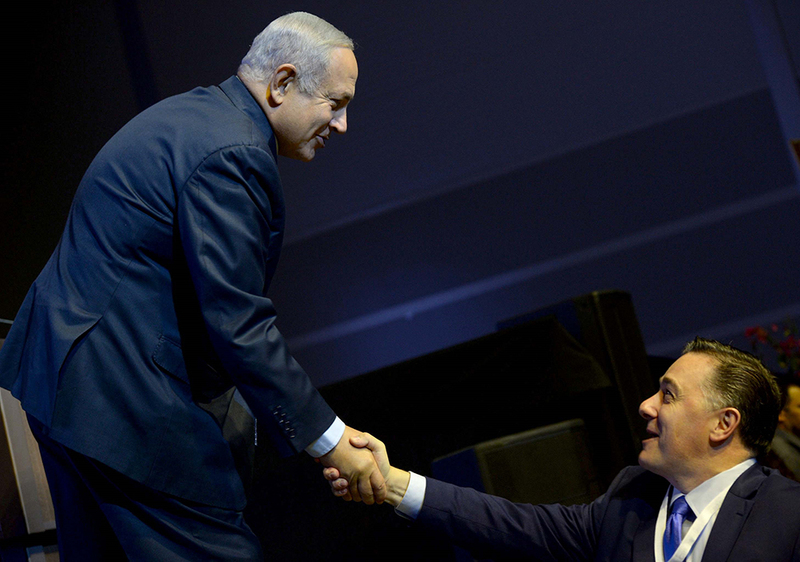 In addition to Rivlin, Netanyahu, and Friedman, the summit included addresses by the speaker of the Knesset, the mayor of Jerusalem, members of the Knesset (and tour of the parliament’s building), other government officials, and leading experts on Israel, as well as four day-long tour options highlighting Israel’s economy, agriculture, culture, and West Bank settlements. An article in the November 8 issue of NRB Today will feature the West Bank settlements tour. Editor’s note: A video of Dr. Johnson’s and President’s Rivlin’s comments is available on NRB’s YouTube channel.